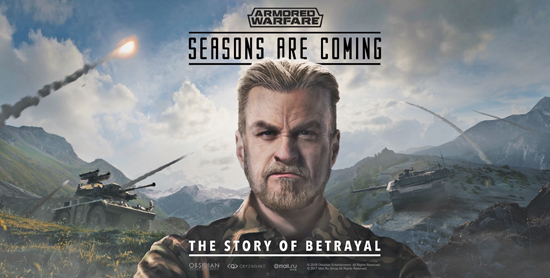 Armored Warfare will change the approach to its development cycle and enter a new stage with the upcoming 'Seasons'. These focused and story-driven content expansions will span multiple months and will replace the current Update-based structures. 'Seasons' consist of chapters and are connected through a special version of the co-operative gameplay mode, drawing a narrative conclusion. The co-operative PvE maps for this game mode have been designed after real world locations and conflicts to give more complexity and depth for an even more engaging tank battles. A season and its chapters will bring new vehicles, new PvP maps as well as thematic decals, rewards, avatars. The overall story follows Magnus, the former mercenary of a military corporation, betrayed and seeking revenge across seasons in a conflict between mercenary companies in the nearby future. The first season, called “Black Sea Incursion”, will start this spring on PC. On PlayStation®4 Seasons will start later this year but will be opened with Special Operation Missions which will give players an introduction to the story of Magnus already in May. Campaign Missions - A series of two separate campaign missions – one for the PvP modes and one for the PvE mode. Tank commanders will be able to participate in a large number of missions of various difficulty levels to earn epic rewards, including special vehicle skins. Brand- new Interface with World Map - A redesign of the default Garage view to match that of a world-spanning conflict of 2042. As a mercenary commander, players will be able to choose their missions on a large map while participating in faction warfare, campaign missions and much more. Battalion Competitive Mode - Assemble a battalion and pit crews against ruthless enemies. Glory and prizes await the winners with the first version of a Battalion competitive mode coming this season. Israeli Main Battle Tank Progression Line - From the Super Sherman tanks to the latest Merkavas, this line covers all the essential Israeli models from the 1950s to the near future. Commanders are taken on a a trip through the Israeli armor history and experience each of the legendary machines first hand. Armor Inspector - Ever wanted to see how exactly does each tank’s armor functions? The Armor Inspector feature will allow to do just that with each tank laid bare. Learn each vehicles armor composition, layout and, most importantly, weak spots. This all is but a glimpse of what awaits you in the next few months. Armored Warfare - the future of modern tank shooters is coming to PlayStation®4 and is currently available on PC through My.com GameCenter and Steam. The military free-to-play MMO lets players take control of cutting-edge war machines and join forces with other commanders to carry out the most difficult co-op missions, compete with rival teams in PvP mode, or experience the real tank action in the revolutionary Global Operations – an explosive mix of competitive and cooperative play empowered by enlarged interactive maps with respawn zones, overhead surveillance drones, AI support, airstrikes, and much more.